Sanlorenzo, one of the most important leading Italian figures among producers of motor yachts over 24 metres, recently presented a new 88 foot that will extend the shipyard's new production range, made up of yachts ranging from 62 to 108 feet. The 88 is similar to the rest of the production range because they have the same driving concept, that offers sober, strict lines and large windows. 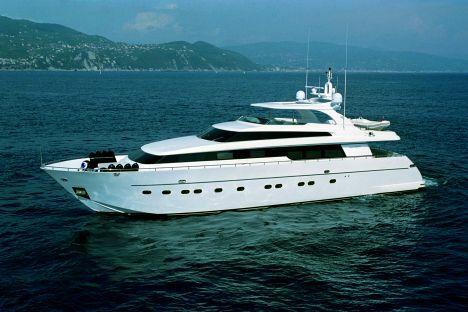 Sanlorenzo 88 spreads across three and a half bridges with the lower one set aside entirely for sleeping quarters. Here we can find the owner's full beam suite at the centre of the boat, with a central double bed, wardrobe and private bathroom. Heading towards bow, we come to two twin guest cabins with separate beds and one Vip cabin with central double bed, all of which naturally have en suite bathrooms. Still on this bridge, at extreme stern, are two crew cabins, both fitted with double bunks and bathroom. The communal living areas are to be found on deck, like the galley that takes up a large part of the bow area together with the crew's dining quarters, while towards stern, there is a bathroom, dining area and large lounge with seating and multimedia equipment. From here, passing through a nicely streamlined glass door, you come to the cockpit, laid out for al fresco lunches or for simple communal living and from where spectacular inter-connecting stairways with fore platform, extend upwards. The middle upper bridge is entirely set aside for the elegant wheelhouse, complete with up to date accessories. A second control point is located on the fly bridge, where there is also a sunbathing area, a dinette with "C" shaped sofa and table, and the platform, for the on board tender and relative crane. The shipyard has proposed two different options for this area, a standard one, as described above and one that comes complete with hard top, a fibreglass structure that starts from the roll bar and heads towards bow, linking up with the windscreen in a virtual line. As far as performance is concerned, the Sanlorenzo 88 relies on a motorization made up of a pair of 1,820 HP Caterpillars which produce a maximum estimated speed of 28 knots. If one wishes, it is possible to opt for the more powerful MTU with 2,000 HP each, that can produce a maximum speed level of 30 knots. For further information: Sanlorenzo - Cantieri Navali di Ameglia; via Armezzone 3; 19031 Ameglia (SP); tel. +39 0187 6181; fax +39 0187 618316. Declared cruising speed: 26/24 knots.